Fishing for any type of fish can be a stressful process if you don’t know what you are doing. Of course, fishing is supposed to be a relaxing and soothing experience and it will be as long as you know what you’re doing! While fishing in general is going to take some time to figure out, you need to make sure you know how to catch specific fish as well so you know what you can target and how to do so in areas populated by a certain fish. When it comes to lake trout fishing, there are some tips, tricks and techniques that you need to keep in mind so that you have the most success you can find every single time you head out on the water. By following the information provided below, you’ll have no problem increasing the number of lake trout you catch when you hit the water next. Before you learn what to do when it comes to catching lake trout, it’s probably important for you to understand a little bit about lake trout fishing including what they look like and where they are most commonly found. Lake trout is a type of trout that is mainly found in North America although it has been introduced into other areas lately. They are going to be found in freshwater and are probably the most popular fish when it comes to game fish. The diet of the fish is a little unusual and it can vary from fish to fish but you will most commonly find them eating insects, snails and other small fish. Typically you are going to find lake trout living on large lakes because they are typically deeper and have plenty of cold water for the lake trout to swim in since that is what they prefer. You should have no problem distinguishing a lake trout from another type of trout because the characteristics are pretty distinct. For example, you’re going to find they have a dark green or grey body with yellow type spots on their body and they have elongated heads. On the flip side of the fish, they typically have a white belly that helps to distinguish them as well. While depth is factor when you go to fish for some certain types of fish, it is going to be incredibly important when it comes time to fish for lake trout. Most of the lake trout seem to want colder water which means that as the seasons progress and it gets warmer outside, you’re going to need to go deeper into the lake to find the lake trout. While the majority of the depth information will be outlined in a point below, it’s important for you to make sure that you stay towards more shallow water when it is cool out but go deeper into the water when it starts to get warm out. Once again, this is a factor that matters when you go to catch any type of fish but is especially important when it comes to fishing for lake trout. However, it is important to understand that there are a lot of factors you need to remember and each one is going to play an important consideration into choosing the lure. Overall, you’re going to want to make sure that you find a lure that closely mimics what the native bait fish looks like to lake trout. If you happen to be confused or you don’t know which is going to work best in the water you’re going to, I recommend talking to employees at your local fish shop or with fellow fishers to find out what lure they have the most luck with. While lake trout are not classified as a schooling fish (meaning fish that stay together in groups), chances are good that they are going to hang out in the same area as other lake trout. This means that if you catch one lake trout in a specific area, you would be wise to hang around for a little bit and see what else bites. If you get one lake trout in the area, you have a better than not chance to get another one in the same area. If you decide to use live bait when you are going to catch lake trout, make sure that you don’t change it up too much and you stick with some of the more classics baits available. For example, I would strongly recommend the classic night crawler as you should experience a lot of success with it. If you choose not to use that, you can try some of the larger minnows as well as salmon eggs to try and catch the lake trout. While it might be one of the most expensive pieces of equipment that you are going to buy to bring with you on your fishing trip, a fish finder is one of the best and easiest ways to help make sure you have everything you need when go fishing and it can really help to increase your chances of finding fish. Furthermore, it’s going to help you find some of the larger trout in the water. You can use the finder to see where baitfish are hanging out and you can see the depth of where the trout are and you can fish according to that information. Especially when it comes to the summertime, you’ll find that one of the best times to head out on the water and catch lake trout is in the morning. Typically, the lake trout are more willing to come to the surface of the water when it is very calm and there is a clear sky, if it is anything other than that, you’ll find that they are less active. In early spring, the lake trout are going to be more active in other parts of the day and you might find them to be more active right before dark. While some fish like to jump at a lure that is moving quickly, you want to make sure that you don’t troll your lure fast when it comes to lake trout. You should troll just enough so that your lure is going to work and don’t go any faster than that. If you are using a slow moving boat without a motor, you are going to have a better chance at getting a bite on your line but it can still be done when it comes to using a quicker moving boat. While there really isn’t any particular season that is going to be the best when it comes to fishing for lake trout, it is important to pay attention to the season you are fishing in since it will affect the depth that you are most likely to find the lake trout in the water. For example, if you head out on the water right after the ice has melted, then you’re going to find the lake trout towards the surface and around a depth of 10 feet. If you head out in the middle of spring, you’re looking at a depth of 30 to 30 feet and if you go towards the end of the spring, it’s likely a depth of 30 to 45 feet. 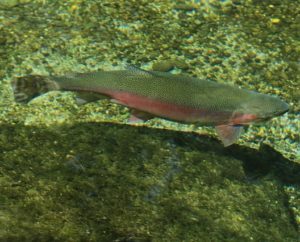 The summer can be pretty tricky because the trout like to go a lot deeper in the water but will typically come shallow when they are looking for food. When it comes to fishing for lake trout, there are a lot of specific things that you need to keep in mind if you want to have the most success overall. Of course, you need to understand that even if you do everything you’re supposed to do, the fish may just not bite for you when you are on the water. However, following the advice provided above is one of the best ways you will find to help increase the chance of you getting more lake trout while you are on the water. Every time you seem stuck and you don’t know what to do to help hook more lake trout, I recommend revisiting this article and testing out some of the tips and tricks that were provided above. 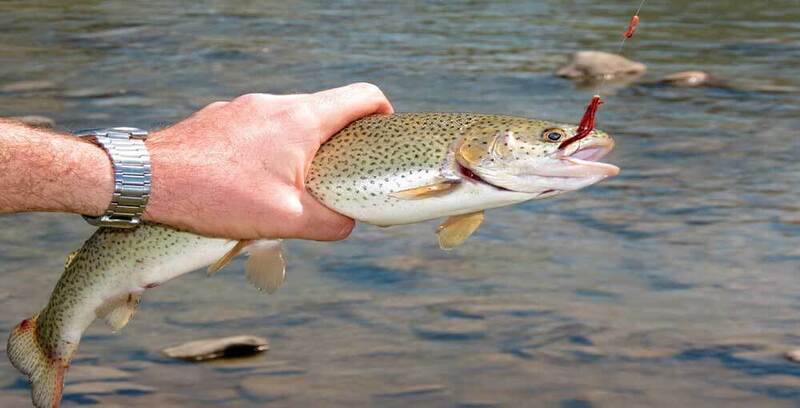 Great article – really enjoy trout fishing and some great tips here, one of my fav sites thx!